Local history note on George Eliot. Mary Anne Evans was born at Arbury Farm, Chilvers Coton, Nuneaton. She was the daughter, by his second marriage, of Robert Evans, a builder and land agent. Evans was a man possessed of ambition, perseverance and great strength of both character and body. He is generally acknowledged to be the model of Caleb Garth in Middlemarch and of Adam Bede. As a girl, Mary Anne was a somewhat reserved and sensitive child with a remarkably developed intellect. It was she who took control of the running of her father’s house after the death of her mother in 1836. Her first published work, a religious poem signed "M.A.E. ", appeared in The Christian Observer of January 1840. In 1841, Mary Anne moved with her father to Coventry. It was here that she made the acquaintance of Charles Bray and his wife Caroline and came under the influence of their free thinking philosophy and progressive attitude to religion. After the death of her father in 1849, she spent some months on the Continent, returning to England in the following year. In 1851, she took rooms in the boarding house at 142, The Strand, London owned by John Chapman who had published her translation of Strauss’ Life of Jesus (1846). 1851 was also the year in which she met George Henry Lewes (editor of The Leader) with whom she later formed a union which, although never legally sanctioned, she regarded as marriage. Her translation of Feuerbach’s Essence of Christianity, the only work of hers which appeared under her real name, was published in July 1854. "We go tomorrow to our new home at East Sheen, a charming village close to Richmond Park. If you write to me, please enclose the letter to G.H. Lewes, Esq./7 Clarence Row/East Sheen/Richmond/Surrey. When you come to London again I hope you will pay us a visit, for I think, apart from any regard for me, it will be a pleasure for you to see that pretty place, and it is far less trouble to get there than to Bayswater. You only have to jump into the train at Waterloo Bridge Station and in ten minutes you will be at Mortlake where you must get down. Mortlake, as I daresay you know, is a lovely village on the banks of the Thames and East Sheen is its twin sister lying close to it. Ask the way to East Sheen and in three minutes you will be at our door. Then you shall have a nice dinner and a nice snooze after it, and then a stroll, along the river or in the Park, such as you can’t get at Coventry even by the help of a carriage." "…an unpretentious-looking Georgian house, ivy-clad, but suitable on account of its quiet and seclusion, though in close proximity to the railway station….at the back was a long narrow garden, enclosed by a high, ivy-covered wall…"
It was during her period in Richmond in Richmond that Mary Anne Evans began her first novel Amos Barton (later retitled Scenes of Clerical Life) and that she assumed the name of George Eliot. In his biography of her, J.W. Cross states that the reasons she herself gave for choosing this name were because "George was Mr Lewes’ Christian name and Eliot was a good, mouth-filling, easily-pronounced word." Other explanations for the choice, have, of course, been given at various times. Probably the most intriguing was put forward by the editor of a Glasgow magazine, whose theory was that the name was an allusion to and a transformation of the sentence "George L. I owe’t" and that the novelist was thus acknowledging her gratitude to Lewes for his encouragement and practical help. Whatever the reason, the name was not an uncommon one and it was successful in concealing the identity of the author. "On our way to the Park the view from Richmond Hill had a delicate blue mist over it, that seemed to hang like a veil before the sober brownish-yellow of the distant elms…As we came home the sun was setting on a fog-bank and we saw him sink into that purple ocean – the orange and gold passing into green above the fog-bank, the gold and orange reflected in the river in more sombre tints." The couple left Richmond in February 1859 and moved to Holly Lodge, Southfields, Wandsworth where she completed Adam Bede (published in the same year) and began to write The Mill on the Floss (1860). Her next novel to be published was Silas Marner (1861). After this, she began work on the monumental historical novel Romola (1863). The writing of this entailed much laborious study and research and she declared that she "began it a young woman and finished it an old woman".1866 saw the publication of Felix Holt the Radical and her last novel was Daniel Deronda, the publication of which was completed in 1876. George Lewes died in 1878. After his death, George Eliot published his unfinished writings and established the George Henry Lewes Studentship in Physiology at Cambridge. In 1880 she married John Walter Cross, a New York banker whom she had first met in 1869. They lived for a time at The Heights, Witley, near Haslemere, the house that she and Lewes had purchased in 1876. Later, George Eliot and her husband took up residence at 4, Cheyne Walk, Chelsea and it was here that she died, on December 22 1880. She was buried beside George Lewes in Highgate Cemetery. Clarence Row, East Sheen was demolished, but is believed to be on the site once occupied by "The Bull Inn" at the corner of Sheen Lane and now offices and shops. In 1905, a new building on the site of 8, Parkshot was used as offices for the Richmond Board of Guardians and later became known as the Parkshot Rooms. That building was demolished in 1975 and in 1976 a new courthouse was opened on the site which also included the old Richmond Swimming Baths. 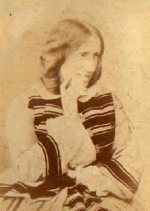 George Eliot (Mary Anne Evans). Photograph.